For those who haven’t read into them, small-sided games (SSG’s) are simply games with fewer players. For us coaches of basketball, that means basketball games with fewer players than the traditional 5 on 5. This can mean games of 3 on 3 (my personal favorite), 2 on 2, 4 on 3, etc. All the different combinations are effective in their own unique way. Basically, the more touches the better! Players will make better decisions when there are fewer players on the court as there are less options to consider. Can we really expect an 6-year-old kid to consistently make a smart pass in a game of 5 on 5? Already lacking skill and basketball experience, we bombard them with four offensive players they can pass to, not to mention the five defenders they also have to worry about. When dealing with young players, we want to start off with only a few options (3 on 3) and then build up from there when they begin to get a feel and understanding for the game. What kid doesn’t love to score a goal? Or at least the opportunity to score a goal for their team? We all see how often little kids sprint up to their parents after the game with a massive smile on their face and enthusiastically tells them how many goals they scored that game. Does it mean they’re bad teammates because they’re worrying too much about scoring? No. They’re young. That stuff will come later. At a youth basketball age we just want them to love the game! An increase in space allows players to get off shots and try different moves without immediately running into a wall of players. As we’ve all seen countless times, young players are drawn to the basketball like a magnet leaving very little room for the player with the ball to be under control and practice anything. Extra space on the court allows players to be creative and practice their skills because there’s less congestion. It’s easy for young players to hide in a game of 5 on 5. It’s not so easy for them to hide in a game of 3 on 3 or 2 on 2. All players have to contribute in SSG’s. Unfortunately, in a typical 5 on 5 game played at a youth level, usually only a couple of players will dominate. They’ll control the ball most of the time and take by far the most shots (usually because of coaches that wants to win). What does that mean for the players on the team that aren’t as good? Rarely will they ever have a chance to bring the ball down the court or take a shot. They’ll end up shying away from the game and standing in the corner. It won’t be long before these players quit basketball forever. This doesn’t happen in 3 on 3. It gives all players an opportunity to develop and everyone has to be involved! To avoid confusion you have to break the game of basketball down into chunks when teaching it. You can’t introduce the pick and roll to players in a 5 on 5 game. There’s too many options and other players when all you want the players to be focusing on is how to run the pick-and-roll. SSG’s allow you to teach small chunks of basketball without confusing your players. You can teach things like the pick and roll, screening away, how to back cut, how to v-cut, etc. 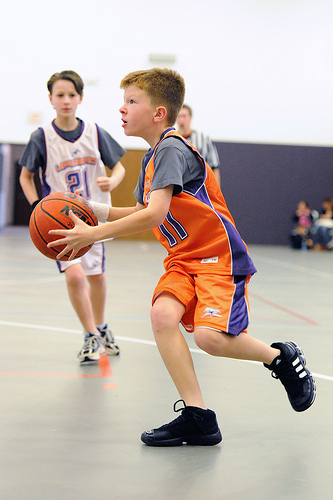 Is there anything worse than a zone defense in youth basketball? If there is, I don’t know about it. In small-sided games you don’t have to worry about zone defenses or beating a press. I believe it’s best for players to first learn how to play in the half court in a slowed down game where they have to make smart decisions before they start learning how to play a fast break style game forced on by full court pressure defense. If all coaches run at practice are drills that work on technique without any opposing player, then when the player faces competition, they won’t know how to use the skill they were taught. Technique drills are great for just that… technique, but players must learn when and how to use the skill in a competitive environment. Small-sided games allow players to put the skill they learnt in technique and practice drills into competition and then learn from experience. To reiterate what I said in the last article, we must put in positions that allow them to make decisions. 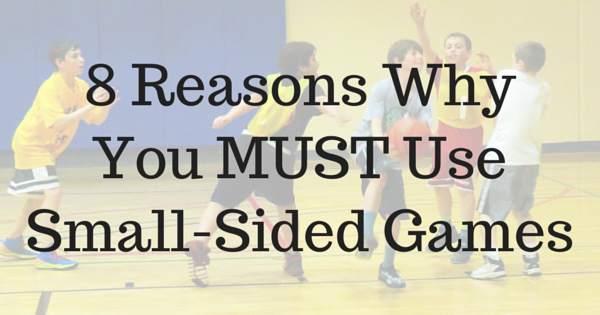 If you look closely at all 7 reasons, you’ll notice an obvious reoccuring trend… Small-sided games make the game of basketball much more fun for our youth basketball players! Increased development and more fun at the same time? That sounds like a win/win situation to me! Coaches: How often do you use small-sided games in your practice?